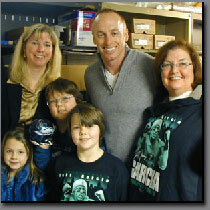 Jeff Garcia He was signed by the Philadelphia Eagles before the start of the 2006 season to serve as Donovan McNabb's back-up and once again found himself as the team's starting quarterback, following a season-ending injury to McNabb. Top Notch for any event! Jeff is a fan favorite and will make any event one to remember. Hear what Jeff Garcia has to say about working with Terry Bender.